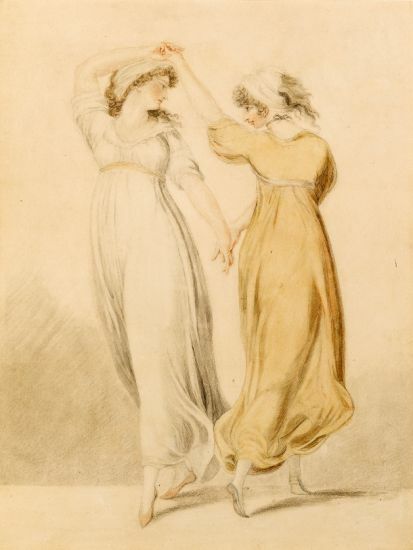 This shows the celebrated Lady Emma Hamilton (1765-1815) dancing the tarantella. She was the mistress of Sir William Hamilton the well-known collector and British envoy at Naples. She became famous for her `Attitudes’, which involved her dressing up and dancing and posing as figures from mythology to entertain Hamilton’s guests at his villa in Naples. In 1791 she married Hamilton but in the late 1790s she famously started an affair with Horatio Nelson while he was recuperating there after the Battle of the Nile. She and Nelson set up home together in London in 1800 and she gave birth to his child the following year. The affair lasted until Nelson’s death at the Battle of Trafalgar in 1805. Lady Hamilton is the figure on the right and is shown dancing the Tarantella, a South Italian folk dance. William Lock the Younger’s father, William Lock (1732-1810) was a well-known patron and collector of contemporary artists and knew Sir William Hamilton. He met Emma in the summer of 1791 at the family house, Norbury Park in Surrey, and wrote to a friend `All the Statues & Pictures I have seen were in grace so inferior to Her, as scarce to deserve a look’ (Elizabeth and Mary Anson, Mary Hamilton, 1925, p. 31). Lock the Younger was a promising artist and was encouraged by Henry Fuseli to go to Rome to study which he duly did leaving in the autumn of 1789 and not returning until the end of 1792 at the earliest. It is not known if he visited the Hamiltons in Naples but he is likely to have seen them when they passed through Rome on their way to Naples in late 1791. Another version of this drawing in pen and ink and pencil on exactly the same sized sheet is in the British Museum (1906,0719.4) and the subject was engraved and published by Mariano Bovi on 2nd May 1796.